All that HOME can send. 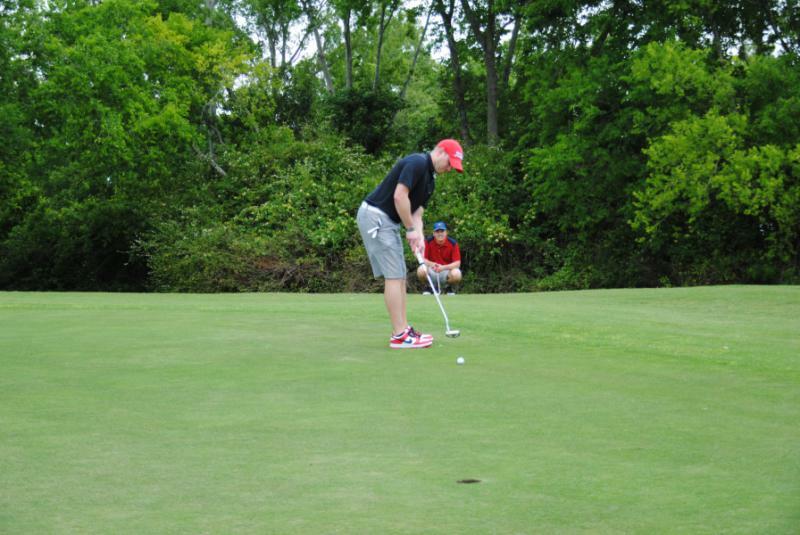 The 5th Annual HOME Golf Tournament had perfect weather along with a perfect group of folks that came out to play and support our military. It was great to see many 'ol friends that I worked with in the aerospace industry. 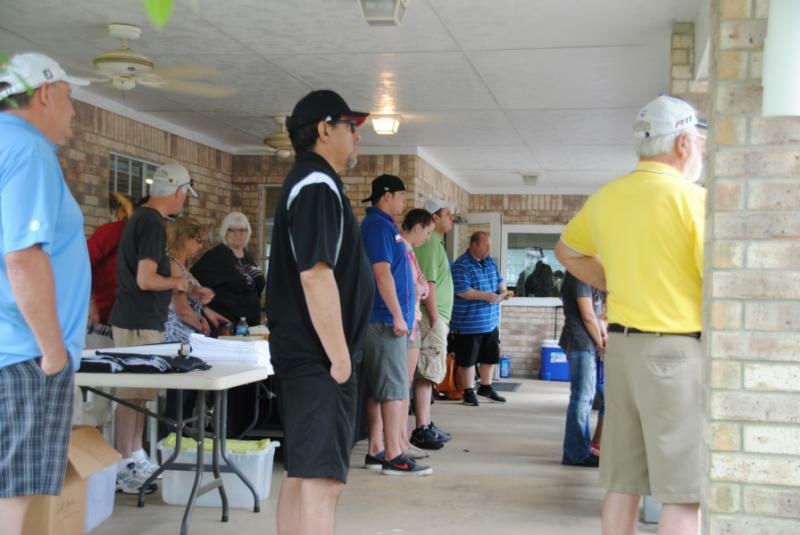 The 147th Reconnaissance Wing Team from Ellington was at the tournament in all their glory to defend their 1st place title for the third year in a row. The jROTC from Pearland High School presented the colors in perfect unison followed by our pledge of allegiance. Colonel Kurt Leslie from the 147th presented me with a very heartfelt gift called a challenge coin from the 147th. According to the story, challenge coins originated during World War I. In one squadron, a wealthy lieutenant ordered medallions struck in solid bronze and presented them to his unit. One young pilot placed the medallion in a small leather pouch that he wore about his neck. Shortly after acquiring the medallion, the pilot's aircraft was severely damaged by ground fire. He was forced to land behind enemy lines and was immediately captured by a German patrol. In order to discourage his escape, the Germans took all of his personal identification except for a pouch that held his coin. In the meantime, he was taken to a small French town near the front. Taking advantage of a bombardment that night, he escaped. However, he was without personal identification. He succeeded in avoiding German patrols by donning civilian attire. Eventually, he stumbled onto a French outpost. Not recognizing the young pilot the French thought him to be a saboteur and made ready to execute him. He had no identification to prove his allegiance, but he did have his medallion. He showed the medallion to his would-be executioners and one of his French captors recognized the squadron insignia on the medallion. Instead of shooting him they gave him a bottle of wine. HOME is honored to have been giving such a thoughtful gift from a group that works every day to defend our country. After a long day on the greens and lots of good food and drink, lots of laughter and mulligans all teams made it back to the clubhouse safely in anticipation of the winning ticket for not only the 1st, 2nd or 3rd place team, but also the closest to the pin or longest drive. Or even the winning raffle ticket for the $500.00 in cash or the wireless entertainment system. 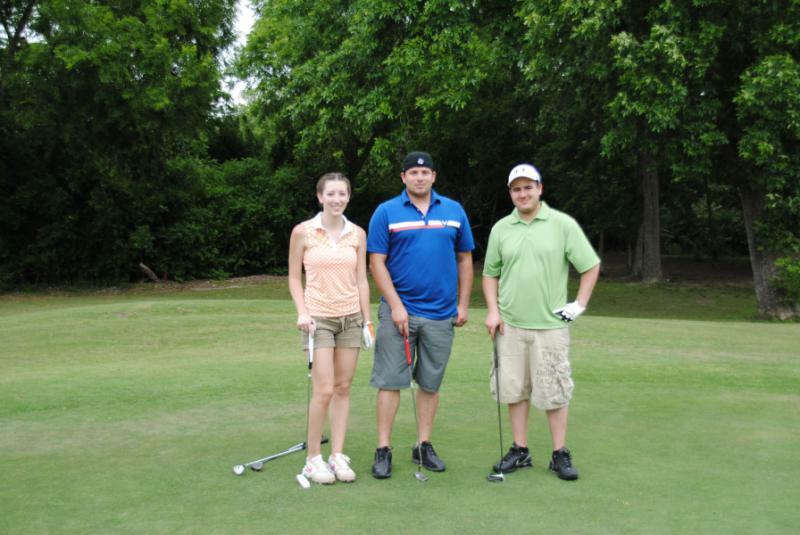 As it went, Colonel Leslie and his daughter Laura are quite a winning team on the golf course. Colonel Leslie won the longest drive and Laura won the closest to the pin. I hear she came within just a few inches of a hole in one. That hole in one would have netted her $5000.00. I'm sure it would have gone towards her college fund. (or a new car). The $500.00 was won by Tom Pace and the wireless system by Brian Manning. HOME thanks each and every one of you for your continued support in Helping Our Military Endure. We have many events coming up for the remainder of the year and hope you all continue to show your support with your donations as we continue to support all our troops serving in far off countries. How many ways can you say Americans are awesome? Let me count the ways. Right now it is 303 ways. 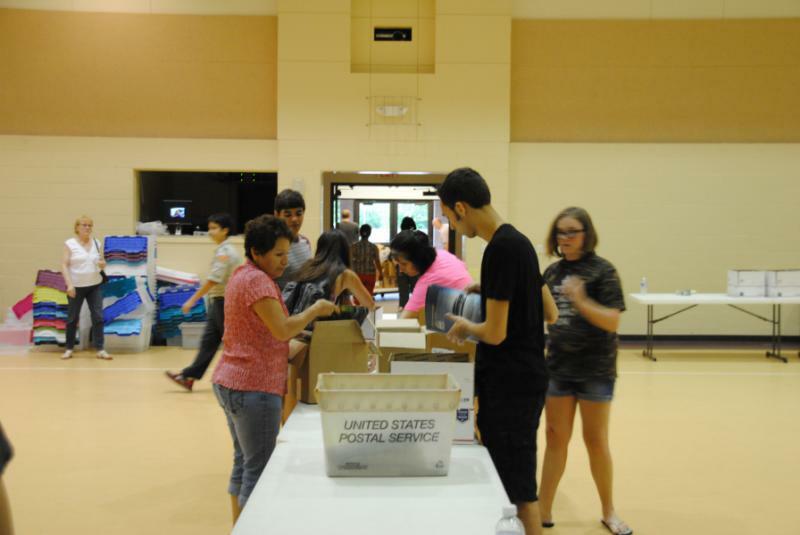 303 care packages were packed at the Christmas in July packing party on Saturday July 12th. 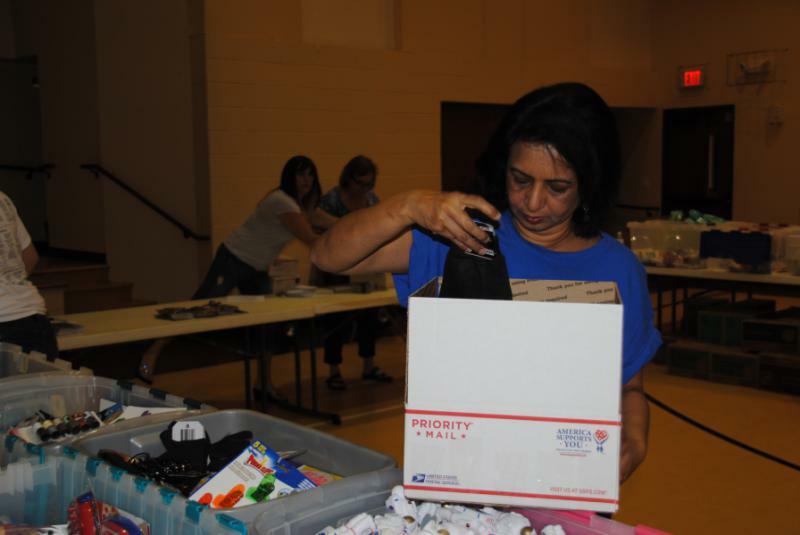 The boxes are filled with generous donations from the public, friends, individual groups, Churches, Scouts, private companies, and local businesses. I could go on and on, but you know who you are. You know what you do for our men and women in uniform. 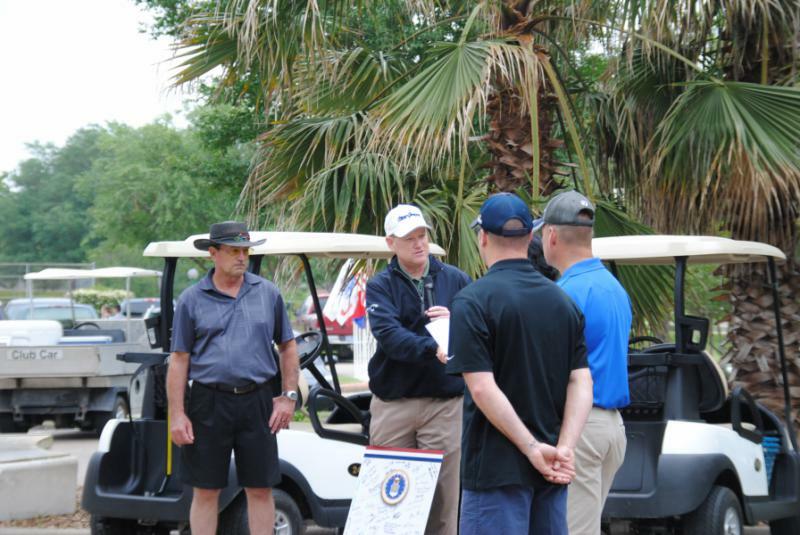 I am humbled from the outpouring of support to our troops at each and every event HOME has. Thank you all for continuing to show your support for the men and women in uniform. The boxes are moving out the door and on the way to Italy, Kosovo, South Korea, Okinawa, Japan, Pakistan, Afghanistan, Egypt, Romania, and Jordan. If you know of someone serving in a far off country, send me their name and shipping address. We will add them to our data bank and will send them a little bit of home from HOME. 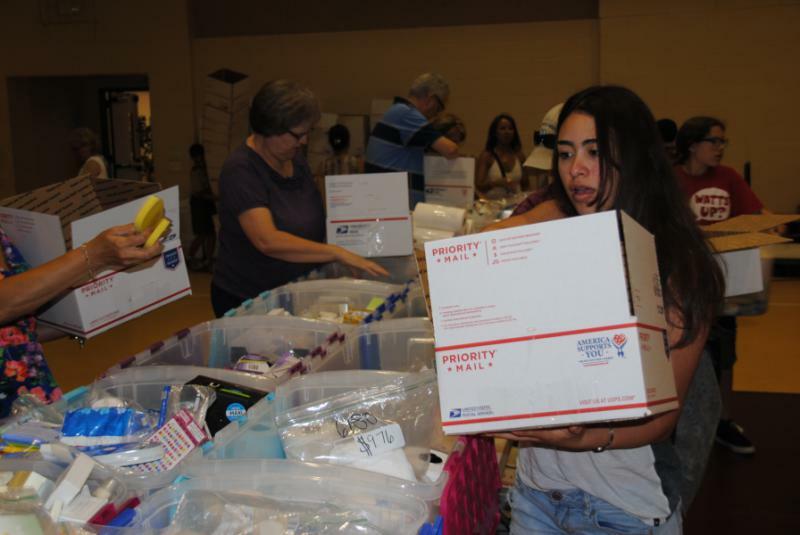 When they open a care package and can see, smell, and taste a part of home, they know in their hearts they are not forgotten. Who doesn't like a surprise package? Even a toothbrush is a treasured surprise. I have been told many times by the recipients of these packages that it feels awesome to have a clean toothbrush. And one with a full head of bristles too. What can you say to that? Nothing! So I buy more toothbrushes and toothbrush holders. Here is a list of items that are VERY, VERY popular in the boxes. Are you ready? In no particular order: drink mixes; toothbrushes and all that goes with them; beef jerky; Slim Jims; laundry detergent sheets (only available online); dice; cards; travel games; towels; baby wipes; small sized shampoos, conditioners, and lotions (they store and travel with the units better); air fresheners; batteries (all sizes); DVD's; music CDs; magazines; books; crossword books; Sudoku books; heavy cushioned socks; eye drops; eye moisturizing gel; saline solution for contacts; bunge cords; X-acto knives; knife sharpeners (both the slide thru sharpener and the stone); pens and pencils; pencil sharpeners; writing tablets with envelopes; and calling cards. Be inventive when you shop. Make a HOME box for your own home and when you shop, buy a little something extra and drop it in the box. It will fill up fast and when it does you can email me that you have donated items to bring to the HOME office. We will let you know when someone will be there for your delivery. The HOME office is located at 17629 El Camino Real, Suite 100. It is near NASA Rd One, close to Webster. Go to your local garage sales and look for baseball gloves. I have sent many in the past and would like to get another bunch of these together for a unit. So put out the word, HOME NEEDS ADULT BASEBALL GLOVES. We have a few events coming up and need your support for our Christmas shipment. That packing party will be December 6th. But remember, HOME ships all during the year and this takes numerous funds for shipping costs as well as items. Start loading up, our bins are empty right now. As always, thank you for your continued support and THANK YOU for Helping Our Military Endure. Pictures and/or videos coming soon. © 2009-2019 HOME - Help Our Military Endure. All rights reserved.